LEARNING & INNOVATION: Come on, Baby, let's do the twist! Come on, Baby, let's do the twist! Being in Carson City, California, is like being in the Philippines. If you are not Filipino, you would seem to be a visitor. Filipinos here are very much part of mainstream USA. There are so many business establishments here that are owned and managed by Filipinos--restaurants, groceries, boutiques, freight forwarding, beauty salon, spa, among others. They also provide employment for many fellow Filipinos. One such enterprising lady is Irene Castillo (Those who remember her as a friend, colleague, classmate or neighbor may call her at +1 310 818 1238). She owns and operates a boutique and a dance studio at Long Beach, California. Irene came to the USA in the early 70s when her husband, who was a serviceman, petitioned for her and her two kids. For a long time she was a housewife and bore two more children. When their kids where grown enough, she worked as a teller at Bank of America; climbed up the corporate ladder; and is now a loan officer. 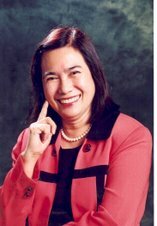 Even while working and serving as a secretary to the United Filipino-American Association, USA, she was in charge of dance activities for their members. Enjoying what she was doing, she started to organize Friday dances on her own; first at Golden Sails Hotel, then at Naga Restaurant. Business was brisk as Filipinos naturally love to go balllroom dancing. When the restaurant was sold, she stopped for a while to rethink her dreams and plans. She wants to do more. Her numerous customers, friends and dance instructors egged her to find a better and bigger place. Fortunately she found this vacant warehouse that used to be a mattress store at 3092 Long Beach Blvd., Long Beach, CA 90807. Last April 2006, she formally opened her Ballroom Craze Dance Club that offers ballroom dancing starting at 7p.m. daily. Irene says that business has always been great especially on Fridays and Saturdays. It is definitely a family affair with sons and daughters and in-laws working together and delineating different roles as floor manager, business manager, dance instructor, housekeeping manager (janitor baga) and others. Last November, 2006, Irene opted to work part-time (28 hours/week) only in BA because she needs to rest more during the day for her nightly duty at the dance club. Their main attraction was their superb mix of music handled by her very talented son, Ernest, who finished Broadcast Communication at CalTech at Long Beach and who formally trained as a DJ. Likewise, the atmosphere at her dance studio is friendly-family and their dance instructors are very talented and professional in their job. Visit them at www.ballroomcraze.com. They also attract a lot of foreigners (hahahahaha) like Mexicans (who love to Salsa and Rhumba), other Asians and Americans. To keep the interest of these dance afficionados, Irene concocts monthly specials like Latin Fiesta, Luau, Filipiniana, Western and also commemorate special occasions like Father's Day, Mother's Day, Christmas. On Mondays and Tuesdays, they give private and group dance lessons. Wednesdays to Sundays are strictly for social dancing. As always, they have raffle prizes to offer. Filipinos are addicted to raffles. Take note, these dance nights are dressy affairs from head to toe, including borloloys for the ladies such as dazzling pieces of jewelry and the de riguer dancing shoes. As a result of this successful venture, Irene also opened an equally profitable boutique that sells dancing shoes, outfits and accessories. On certain days, she sublets her dance studio for private parties like weddings, baptismal, birthdays, meetings and others. BIG, BIG THANKS to my hosts in Canada. My Kappa Gamma Omega Sorority Sister Millette Asuncion-Rabanillo and her husband Jerry and daughters Christine (husband Jason) and Jennifer. In Montreal, Delta Omega Delta Fraternity Bro Pons Abdon and wife Cora. In Toronto, Volet and Ivan Guerrero. And here in the land of milk and honey, my best friend Gina Camacho, her husband Frank, sister Pinky, brother Stephen and wife Cora, niece Kathryn and nephews Jade and Sidney. Next week, we will have a reunion of former employees of Resins, Inc. I am having a great ball and i'll tell you more about it. Promise, babalik ako sa 'Pinas. As my sons would say, the Philippines is still the best place to live in. What’s up in the Netherlands?